Grade 3 Worksheet for the end of term 1. It guides children to compare numbers, first as numbers, then as number sentences. 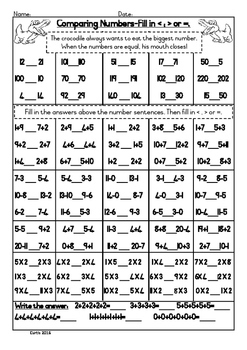 It also has repeated addition at the end of the worksheet. It uses the graphic of a crocodile to show that the crocodile always eats the bigger number. I draw teeth in the crocodile's mouth too.